In a previously published book, True Alignment: Linking Company Culture with Customer Needs for Extraordinary Results, Edgar Papke offers a measurable and observable approach to achieving and then sustaining alignment of customer needs with an organization’s leadership, culture, and brand intention. This is indeed a major challenge to business leaders. Papke agrees: “To confront this challenge, leaders need a systemic framework for understanding, assessing, and creating alignment. They and their teams and organizations require an approach that cuts through the complexity and eliminates the noise from multiple priorities, numerous initiatives, and the confusion of choices and options; an approach that provides a clear and simple roadmap to success.” I agree with all that except the word “simple.” If the process really were simple, there would be no need for this book, or for any of the other 3,623 books on business alignment that Amazon now offers for sale. Contrary to what some people may think, conflict is not necessarily undesirable. Throughout history, great leaders have created situations in which conflict in the form of principled dissent is needed to find the right solution to an especially serious problem, to find the right answer to an especially important question. 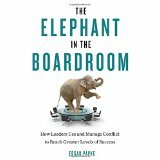 This is probably what Papke has in mind in The Elephant in the Boardoom when observing, “Regardless of which approach to leadership you may subscribe to, the primary challenge to becoming a great leader is to confront and constructively manage the conflict that is at the heart of how our institutions, organizations, and teams function; conflict that is the result of the innate desire of human beings to compete and fulfill our wants and needs, and that reveals differing views, values, beliefs, and ideas; conflict that also too easily manifests into dysfunctional, unproductive, and destructive behavior” when there is an absence of effective leadership to prevent that behavior. The value of the material, insights, and counsel that Edgar Papke provides is incalculable. The key to resolving a conflict is to approach it as an opportunity rather than as a peril. Those who read this book will be much better prepared to do that when resolving conflicts, forging a consensus, and alleviating tensions more quickly and more thoroughly than they otherwise could. All organizations need effective leadership at all levels and in all areas of the given enterprise. They are stewards and viewed as authentic, guided by what Jim O’Toole characterizes as a “moral compass” and by what Bill George characterizes as their “True North.” They see themselves as being what Robert Greenleaf calls servant leaders. It is no coincidence that most of the companies annually ranked among those that are most highly admired and best to work for are also annually ranked among those that are most profitable and have the greatest cap value in their industry. They have developed such leadership because they know that, with all due respect to vision, presence, and emotional intelligence, they also need leaders whose skills and temperament enable them to leverage conflict whenever and wherever it occurs.